Universal to go DRM-free on iTunes? iTunes Plus currently sells EMI tracks DRM free for 20p more. Could Universal be next? Rumours are bounding about the web which say that Apple and Universal Music are currently locked in talks which could result in the record label joining British super-label EMI in the iTunes Plus scheme. If it goes ahead, it would see Universal's music catalogue becoming available on iTunes at a higher bitrate than normal and more importantly, DRM-free. These DRM-free tracks, available at 256kbps, are sold for 20p more than normal - 99p instead of 79p each. But there are also reports that suggest Universal wants more control over the pricing of these 'special' tracks so it's possible that Universal DRM-free tracks might cost more than the 99p you pay for EMI ones. Apple launched the iTunes Plus service at the end of May with its iTunes version 7.2 update. The first time you buy an iTunes Plus song, you specify whether to make all future purchases iTunes Plus versions (where available). You can change this setting by accessing your account information on the iTunes Store. The tracks bought through iTunes Plus replace the lower-quality versions of the track. 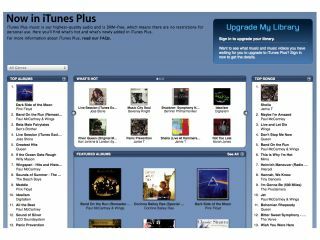 The iTunes Plus store has attracted controversy over the last week after it emerged that DRM-free music tracks would be sold with personal data encoded inside them. This is designed so that if the tracks make their way onto P2P sharing networks, they can be tracked back to the source. But the presence of this personal data in your purchased music tracks is nothing to worry about , say some analysts. That's because the only people it will affect are those who illegally share their music libraries over the web.